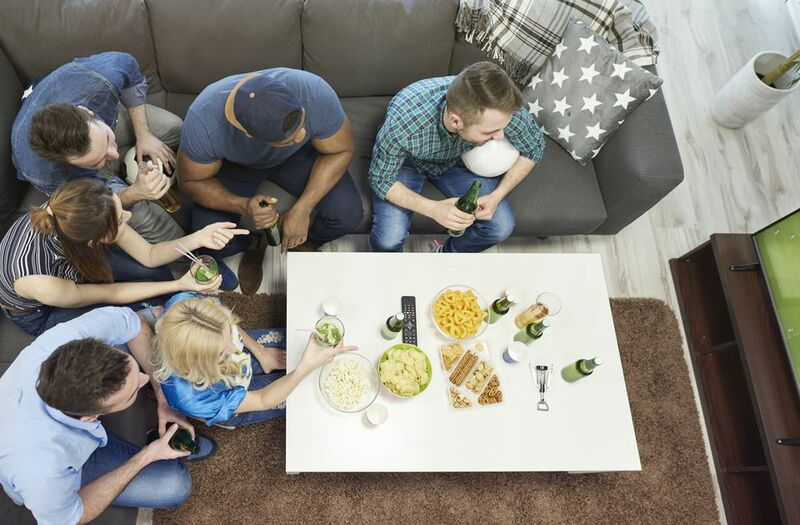 Don't let the athletes on television have all the fun at your next football or Super Bowl party. Plan a few activities to give your guests something to do during halftime. They will appreciate having another option besides eating more buffalo wings. If your budget allows, it might be a fun idea to stock up on fun prizes such as footballs, pennants, drink cups and team clothing items so that everyone will go home feeling like a winner. Not everyone is as committed to watching football as your significant other. Sometimes people just like the camaraderie of sharing a Sunday afternoon or evening with friends eating some good party dips. Football party games help guests get to know one another better and help break awkward silences during commercial breaks. Friends and family will be begging you to throw weekly football gatherings to create new memories with the people they love the most. Try one or all of these games at your football party, but be careful not to get in the view of the TV. You would not want to upset any die-hard football viewers who are at the party purely for their spot in front of their favorite team. Challenge your guests to a football tossing contest. If you can play outdoors, the person who can toss a football the farthest wins. If it needs to be an indoor contest, use a foam football and have your guests toss it through a hula hoop or into a basket. The winner is the guest who can make the target the most times out of five attempts. A koozie decorated in favor of your best team could be a great prize idea for this contest. At the beginning of halftime, give your guests small paper footballs to stick onto their chests with double-sided tape. Tell everyone they're not allowed to say the word "football" while in conversation during halftime. If a guest hears someone use the word, they can take the football from the offending party. The person who collects the most footballs is the winner. Maybe this person will win an actual football to take home. If you have enough room, inside or outside, mark out a small football field with masking tape, and be sure to mark the yardage since it will be necessary for scoring the game. Divide your guests into two teams and have them take turns tossing bean bags onto the other team's side of the field. Keep score of the yardage points where the bags land, with a touchdown scoring 0 points. The team with the lowest yardage wins. If you have younger guests at your party, or if you have older guests who are young-at-heart, organize a game of hot potato with a football. The last person left in the circle is the winner. Take good old football bean bag toss to the next level and decorate some corn hole targets decorated in favor of your best team winning. What Are Some Ideas for an Old-Fashioned Picnic Party?